"Is so-and-so here?" Family members and teachers walked the burnt plain looking for missing children. They searched through relief stations crammed with the wounded and the dead. The scenes at usable school buildings were extraordinary-the injured poured in, and an endless stream of dead were carried out to the schoolyard for cremation. Teachers hastily created offices in charred, ravaged schools, then desperately collected information on students to provide to families when they came to inquire. 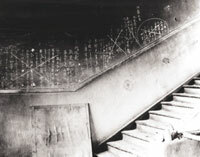 October 6, 1945 Fukuromachi National School (Fukuro-machi) Photo by Shunkichi Kikuchi Courtesy of Tokuko Kikuchi Messages scrawled on walls of schoolhouses standing in the burnt plain, bereft of paper or pencil, were key means of communication. 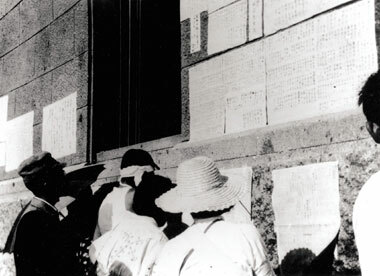 This notebook records events from the day of the atomic bombing until the school reopened on September 15. It describes the mass confusion and conditions at the school after the bombing-firefighting, searching for students, coping with a dead student-until the resumption of classes. Shudo Junior High School sent 180 second-year students to help with building demolition near the City Hall. Of these, 136 died.